A modular handrail system is one that can be supplied in individual components and then assembled to fit the job at hand. This means you can purchase the specific stanchions, pipe, balustrade panels and connectors separately that you need for your design. Alternatively, if you’re not sure exactly what you’ll need on site you can take a selection of components and design as you go. Other benefits of a modular system over a pre-fabricated railing is that tweaks can be made during installation. Additionally, they are easy to transport, quick to install and the latter requires no specialist skills or tooling. Meshstore stocks the Monowills Link modular handrail system by Webforge, which we consider to be the best system available on the market. Link has been designed for a multitude of common barrier scenarios, with components available to meet the most demanding applications. The Monowills Link range includes tubular handrails and stanchions, as well as all connectors (Links). Together they provide a robust system designed to comply with Australian Standards such as AS1657; as handrails, safety barriers or balustrades for platforms, walkways, mezzanines, stairways or even machine guarding. A well designed modular system should be extremely easy to install. This comes down to components that are easy to work with and a system that is adaptable enough to cope with whatever situation you find on site. We understand that not everyone who wants to put in a run of safety barrier or a section of balustrade will have extensive technical drawings for the design or layout. With Monowills Link you certainly won’t need IFC drawings to specify components or to assemble them. Every part of this modular handrail system can be adjusted or tweaked during installation. Links, stanchions and pipes are securely connected with grub-screws, which means there is no need to weld connections, they simply bolt together. This also means that Monowills Link can be installed in areas that would otherwise require permits for welding. Monowills Link posts (stanchions) can either be built from scratch using pipe and components or bought pre-assembled, but either way, the system will be delivered in convenient pieces which can be moved in to place far more easily than fully fabricated products. Since safety barrier systems are primarily used in safety critical applications, often with access issues, this feature is a huge drawcard. Monowills Link can meet these requirements at every step. Every component is rigorously tested for performance and strength after they have been manufactured and will be supplied with documentation confirming this. To ensure compliance the system also needs to be installed appropriately and you’ll also find enclosed easy-to-follow installation instructions. Monowills components are strong enough to meet these requirements. With a tensile strength exceeding 350MPa, Monowills stanchions, pipes and links are on par with structural grade steel – meaning they are capable of tolerating high loads and can be relied on in safety critical applications. For added security, all connectors (Links) have a 7 mm hole on the rear of each piece. These will take a self-drilling screw, which can be added to any system for an additional layer of security for peace of mind. Monowills Link also has an indicator plug that fits into the grub screws used in the system. This allows installers and maintenance staff to inspect installed rails and get a visual indication of movement in any of the screws. It’s a quick and easy way to determine if any components may need tightening without having to physically test every single connection in a system. The Monowills Link range has a component for every situation and is extremely flexible in the number of applications it can be used for. Handrails, balustrades and safety barriers can be built on walkways, platforms, stairs and mezzanines regardless of layout and the components are capable of being configured in almost infinite ways. 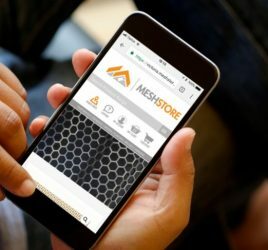 While you can buy pipes and links individually, Meshstore Western Australia also stocks pre-assembled stanchions which can make the installation process much quicker. Stanchions are available in a huge range of configurations, which also have multiple options for base plate types. These include modular and welded, each able to be platform or side mounted as well as those with no base plate, able to be installed directly into the ground. As with the stanchions, the links are available in multiple configurations. These range from double and single sided T-Links to angled links for the top and middle rails that can pivot from five to 45 degrees. There are also options for elbow pieces, the aforementioned base plates, and optional kick plate brackets. All components in the range have been hot dip galvanised and can be used for applications both in and outdoors without the risk of rust or the need for regular maintenance. The system can be painted if preferred, but this is not a requirement. Monowills Link components are built to last. If you’re looking for a railing solution for a cycleway or bike lane, Monowills Link has you covered here too. Monowills Link Velocity is a sub-range developed specifically for bike paths. These are approximately 400 mm taller, and feature an indented top rail to eliminate the possibility of a cyclist catching their pedals on the lower rails. The Velocity series has been designed in accordance with the Austroad cycleway guidelines and is popularly used by councils across Australia and New Zealand. Contact our Perth Branch for details.